Proposal: How does dance, with its mutable input and unfixed traces, inform, alter, or influence the observer (and promote a re-evaluation of the gaze) in visual art contexts? How is this different from performance art and other forms of live art exhibited in those same contexts? Was Judson a strategy? On September 16, 2012, five individual artists and two collectives were elected by the Movement Research community and attending audience to respond to four audience-nominated research proposals. The elected artists include AUNTS, luciana achugar, Maggie Bennett, the Bureau for the Future of Choreography, Walter Dundervill, Moriah Evans, and Ximena Garnica. Each individual research residency will incorporate a public component that includes open rehearsals and audience talkbacks during regular Museum hours. An additional series of discussions and performances will provide context and further research as they reconsider the permutations of influence that continue to echo from the Judson Dance Theater. To conclude the residency, the elected artists will share their findings for further discussion and debate in a final presentation on Sunday December 16 at 3 p.m.
Maggie Bennett is a choreographer/performer whose work explores an intersection between the body, landscape, and architecture through choreographic installation and cross-disciplinary collaboration. She was an artist in residence at Dance Theater Workshop through Fresh Tracks Series (2008) and a Studio Series Residency (2011), and was a 2009/2010 Movement Research Artist in Residence. Other residences include Location One (NYC), FACADE/FASAD (Brooklyn), Pieter psad (LA), the Broken Neck (Austin, TX), and Ritual and Research (Worthington, MA). Walter Dundervill’s choreography has been presented at Dance Theater Workshop, the Chocolate Factory, Movement Research at Judson Church (MR), and the Solo in Azione Festival, Milan, Italy, (via MR’s MRX program). He has received Bessie Awards as a performer in RoseAnne Spradlin’s under/ world, for the costume design of Luciana Achugar’s Puro Deseo, and for the visual design of his own choreography Aesthetic Destiny 1: Candy Mountain. 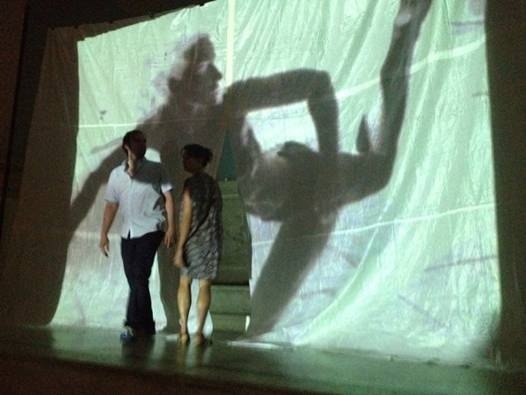 Dundervill is a 2012/13 Studio Series resident at New York Live Arts. He was a 2010/2011 Movement Research Artist in Residence and a co-curator of the MR 2010 Spring Festival. “Movement Research in Residence: Rethinking the Imprint of Judson Dance Theater Fifty Years Later” has been organized in collaboration with Barbara Bryan (Movement Research Executive Director) and Levi Gonzalez (Movement Research Programming Advisor), and is presented as part of the New Museum’s RE:NEW RE:PLAY residency series, curated by Travis Chamberlain.